The United States is losing ground in education, as peers across the globe zoom by with bigger gains in student achievement and school graduations, a study shows. Among adults age 25 to 34, the U.S. is ninth among industrialized nations in the share of its population that has at least a high school degree. In the same age group, the United States ranks seventh, with Belgium, in the share of people who hold a college degree. By both measures, the United States was first in the world as recently as 20 years ago, said Barry McGaw, director of education for the Paris-based Organization for Cooperation and Development. The 30-nation organization develops the yearly rankings as a way for countries to evaluate their education systems and determine whether to change their policies. McGaw said that the United States remains atop the "knowledge economy," one that uses information to produce economic benefits. But, he said, "education's contribution to that economy is weakening, and you ought to be worrying." 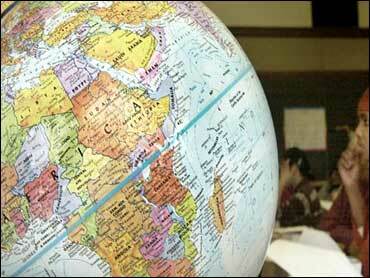 The report bases its conclusions about achievement mainly on international test scores released last December. They show that compared with their peers in Europe, Asia and elsewhere, 15-year-olds in the United States are below average in applying math skills to real-life tasks. Top performers included Finland, Korea, the Netherlands, Japan, Canada and Belgium. Given what the United States spends on education, its relatively low student achievement through high school shows its school system is "clearly inefficient," McGaw said. In all levels of education, the United States spends $11,152 per student. That's the second highest amount, behind the $11,334 spent by Switzerland. "The very best schools in the U.S. are extraordinary," McGaw said. "But the big concern in the U.S. is the diversity of quality of institutions — and the fact that expectations haven't been set high enough." The Bush administration says the 2002 federal law known as the No Child Left Behind Act is fueling higher achievement among all students — particularly poor and minority kids — by holding schools accountable for progress. But the international data, mostly gathered in 2003, are not recent enough to confirm that the law is producing results, McGaw said. Higher education in the United States remains strong, and the nation continues to hold an advantage in innovation based on research conducted at universities, he said. The report also underscores that women continue to get paid less than men. Women in the United States who are 30 to 44 and who hold a university degree — meaning a bachelor's degree, master's degree, doctorate or medical degree — make only 62 percent of what similarly qualified men do. That's a lower rate than in all but three of the 19 countries for which numbers are available. The nations with greater inequity in pay are Germany, New Zealand and Switzerland.